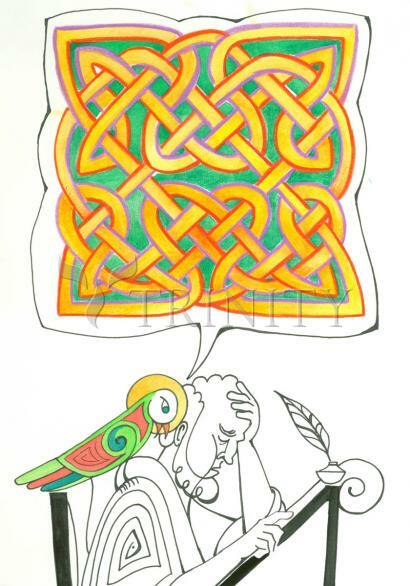 "To have a raven's knowledge" is an Irish proverb meaning to have a seer's supernatural powers. The raven is considered to be one of the oldest and wisest of all animals. Ravens were the favorite bird of the god Lludd, the Celtic god of artists and artisans. He was said to have two ravens to attend to all of his needs (similar to Odin and his ravens). Birds assume a variety of roles in mythology and religion. They play a central part in some creation myths and frequently appear as messengers of the deities. They are often associated with the journey of the human soul after death. Birds also appear as tricksters and oracles. Ravens and other species that feed on carrion, the flesh of the dead, may be symbols of war, death, and misfortune, as well as mediators between humans and the supernatural world. Other birds represent strength, love, and wisdom.